Vidusara Interview: ජාතික ආර්ථික සංවර්ධනයට විද්‍යා සන්නිවේදකයන්ට කුමක් කළ හැකිද? 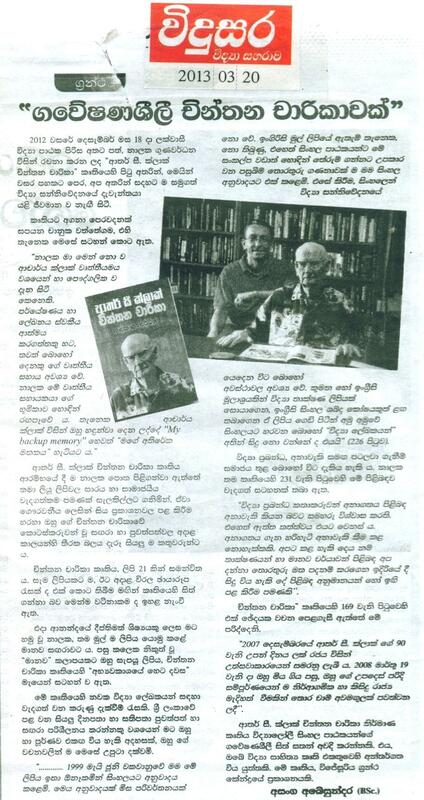 Vidusara, Sri Lanka’s only science and technology weekly magazine, has interviewed me in their issue dated 5 November 2014, which marks their 27th anniversary. They talked to me about the role of science journalists and other science communications in promoting science and technology for national economic development. ජාතික ආර්ථික සංවර්ධනයට විද්‍යා සන්නිවේදකයන්ට කුමක් කළ හැකිද? රටක ආර්ථික සංවර්ධනය උදෙසා විද්‍යාව, තාක්‍ෂණය හා නවෝත්පාදන උපයෝගී කර ගැනීමේ වයායාමයේදී විද්‍යා ජනමාධවේදියා සතුව ද පැහැර හැරිය නොහැකි වගකීමක් තිබේ. මේ ඒ සම්බන්ධයෙන් දේශීයව මෙන්ම විදේශීයව ද බහුවිධ සන්නිවේදන මාධ්‍ය හරහා විද්‍යා සන්නිවේදන කටයුතුවල නියැලෙන ප‍්‍රකට විද්‍යා මාධ්‍යවේදියකු සහ විද්‍යා ජනමාධය උපදෙශකවරයකු ද වන නාලක ගුණවර්ධන මහතාගෙන් කළ අදහස් විමසීමක දී ඔහු දැක්වූ අදහස් ය. ඒ මහතා COSTI ව්‍යපෘතිය යටතේ ක‍්‍රියාත්මක සැමට විද්‍යාව සඳහා වන ජාතික මණ්ඩලයේ සම සභාපති ලෙස ද කටයුතු කරයි. ප‍්‍රශ්නය: ආර්ථික සමෘද්ධිය වෙනුවෙන් විද්‍යා මාධ්‍යවේදියාගේ දායකත්වය කෙතරම් තීරණාත්මක ද? පිළිතුර: මේ දායකත්වය අතිශය වැදගත් නමුත් එහි නිසි ඵල නෙළගත හැක්කේ සෙසු පාර්ශ්වයන් ද මේ සංවාදයෙහි ක‍්‍රියාකාරිව නිරත වුවහොත් පමණයි. මා එයින් අදහස් කළේ පර්යේෂකයන් සහ ප‍්‍රතිපත්ති සම්පාදකයන් අතර සමීප කතිකාවක් මේ පිළිබඳව ඇති විය යුතු බව. රටේ ආර්ථික අභිවෘද්ධිය උදෙසා විද්‍යාව, තාක්‍ෂණය සහ නවෝත්පාදනයන්හි උපයෝගීතාවෙහි වැදගත්කම පිළිබඳ දැක්මක් ප‍්‍රතිපත්ති සම්පාදකයන් තුළ ඉබේ පහළ වන්නේ නැහැ. එය ඇති කළ හැක්කේ පර්යේෂකයන් සිය විද්‍යාත්මක සොයා ගැනීම් පාදක කර ගත් අදහස්වල ආර්ථිකමය වටිනාකම් ඔවුන්ට ඒත්තු ගැන්වූවහොත් පමණයි. කවර තාක්‍ෂණයන් කවර විද්‍යාවන් වඩාත් ඵලදායක ද යන්න සම්බන්ධව දෙපාර්ශවයට එකඟතාවකට පැමිණිය හැකි වාතාවරණයක් ඇති වන්නේ එවිටයි. අවාසනාවකට බොහෝ පර්යේෂකයන් මෙවැනි සන්නිවේදනයට යොමු වන්නට මැළිකමක් දක්වන බවක් තමයි පෙනෙන්නට තිබෙන්නේ. තමන්ගේ පාඩුවේ විද්‍යාත්මක කටයුතුවල යෙදීමක් පමණයි ඔවුන් කරන්නේ. ජාතික මට්ටමට සිය පර්යේෂණ ප‍්‍රතිඵල රැගෙන යන්න උනන්දු වන්නේ සාපේක්‍ෂව ටික දෙනෙකු පමණයි. ඒත් මේ පසුගාමීත්වය රටට අහිතකරයි. උදාහරණයක් විදියට 2012 වසරේ දී අප රටේ සමස්ත අපනයන ආදායම තුළ උසස් තාක්‍ෂණ අපනයවනලින් ලැබී තිබුණේ සියයට 5 කට අඩු ආදායමක් පමණයි. මට මෙහිදී සිහිපත් වනවා මීට වසර25 කට උඩදී නොබෙල් සම්මානලාභී විද්‍යාඥයකු වන පාකිස්තාන ජාතික ආචාර්ය අබ්දුස් සලාම් මා හා පළ කළ අදහසක්. ඔහු පෙන්වා දුන්නේ විද්‍යාඥයන්ට සිය රටේ අභිවෘද්ධිය වෙනුවෙන් මෙවැනි සංවාදයකට මුල පිරීම සඳහා පැහැර නොහැරිය හැකි වගකීමක් ඇති බව. එය පවත්නා දේශපාලන ප‍්‍රවාහයට කැමැත්තක් තිබුණත් නැතත් සිදු කළ යුතු ජාතික දායකත්වයක් බව ඔහු පැවසුවා. මා සිතන්නේ අදටත් ඔහු එදා කී දේ අපේ රටට අදාළ බවයි. මේ වන විට අප රටේ ජෛවතාක්‍ෂණය, නැනෝතාක්‍ෂණය, තොරතුරු තාක්‍ෂණය වගේ අංශ කිහිපයකට අදාළව නම් විද්‍යාඥයන් හා ප‍්‍රතිපත්ති සැලසුම්කරුවන් අතර සතුටුදායක සංවාදයක් ඇති වෙමින් තිබෙනවා. මේවා ජාතික ධනය ඉපදවිය හැකි ක්‍ෂෙත‍්‍ර හැටියට අදාල බලධරයන් පිළිගෙන තිබෙනවා. මෙවැනි ක්‍ෂෙත‍්‍ර ගැන විද්‍යා මාධ්‍යකරුවා විශේෂ අවානය යොමු කළ යුතුයි. විද්‍යා මාධ්‍යකරුවාට මෙවැනි සංවාදයන්හි හවුල්කරුවකු විය හැකියි. ඔහුට මෙහිලා උත්පේ‍්‍රරකයක හැටියට ක‍්‍රියා කළ හැකියි. ප‍්‍රශ්නය: අප රටේ විද්‍යා මාධ්‍යවේදින්ට ඔබ කියන ආකාරයේ දායකත්වයක් සැපයීම සඳහා සුදුසු පරිසරයක් පසුබිමක් පවතිනවා ද? පිළිතුර: විද්‍යා මාධ්‍යවේදියාගේ තරාතිරම මෙහිදී වැදගත් නැහැ. ඒ කියන්නේ කුමන සන්නිවේදන මාධ්‍යයක සිටියත්, ස්ථිර මාධ්‍ය සේවයේ සිටියත් නොසිටියත්, අත්දැකීම් මද වුවත් නැතත්, වයසින් අඩු හෝ වැඩි හෝ වුවත් ප‍්‍රශ්නයක් නැහැ. ඕනෑකමක් සහ කැපවීමක් තිබේ නම් උපක‍්‍රමශීලීව මෙවැනි සංවාදයන්ට දායක වීමේ හැකියාව තිබෙනවා. නැවතත් මගේ පෞද්ගලික අත්දැකීමක් පවසන්න කැමතියි. මා මෙරට ටෙලිවිෂන් මාධ්‍ය දෙකක නව නිපැයුම්කරුවන් දිරි ගන්වන, ඔවුන්ගේ ගැටලූ කතා කරන වැඩසටහන් පෙළක් කර තිබෙනවා. ඔවුන්ගේ හැකියාවන් ජාතික ප‍්‍රශ්න විසඳීම සඳහා දායක කර ගත හැක්කේ කෙසේද යන්න, එය කළ හැකි ද යන්න, නව නිපැයුම්කරුවන් ගේ කොමිසමේ ප‍්‍රධානින්, ඒ වගේම පර්යේෂකයන් සමග මේ වැඩසටහන්මාලා තුළින් කතාබහට ලක් කරන්න මට අවස්ථාව ලැබුණා. ඒ වගේම නරඹන ජනතාවට රටේ කාලීන ප‍්‍රශ්න අළලා නව නිර්මාණ ඉදිරිපත් කිරීමට අභියෝගයන් ද මේ වැඩසටහනෙන් ඉදිරිපත් කළා. මදුරුවන් බෝවීම අඩු කිරීමට, ආහාර කල් තබා ගැනීමට, බලශක්ති සංරක්‍ෂණයට වැනි සමාජ ආර්ථික අවශ්‍යතා සඳහා හොඳ යෝජනා ජනතාවගෙන් ලැබුණා. ඉතා ජනප‍්‍රිය වූ මේ වැඩසටහන් මාලාවකට ටෙලි සම්මානයක් මටත් එහි නිෂ්පාදකවරයාටත් හිමි වුණා. මෙයින් මා කියන්නට උත්සාහ කළේ අර්ධ වශයෙන් සම්පූර්ණ වටපිටාවකට වුවත් වුවමනාවක් ඇත් නම් රටට දැනෙන යමක් කළ හැකි බවයි. ප‍්‍රශ්නය: අපේ විද්‍යා මාධ්‍යවේදීන් රටේ ආර්ථික සංවර්ධනය සඳහා ක‍්‍රියාත්මක විය යුත්තේ ඔබ දකින ආකාරයට කවර ආකාරයෙන්ද? පිළිතුර: විදුසර ආරම්භ කළ මීට වසර 27කට පෙර තිබූ මාධ්‍ය යථාර්ථ ද අද වෙනස් වෙලා. විශේෂයෙන්ම තාක්‍ෂණිකව පෙරැළියක් ඇතිවී තිබෙනවා. අද සන්නිවේදකයකුට එක් මාධ්‍යයකට සීමා වෙන්න බැහැ. අද සන්නිවේදනය මුද්‍රිත, විද්‍යුත්, ඉන්ටනෙට් යනාදි වශයෙන් මාධ්‍ය රාශියක අභිසරණයක් (Media convergence) නැතිනම් ඒකරාශී වීමක්. ඒ නිසා මේ බහු මාධ්‍යය තුළ ම කුසලතාවන් හැසිරවීමේ හැකියාව විද්‍යා මාධ්‍යවේදියකු ප‍්‍රගුණ කළ යුතුයි. ආරම්භයේදී මට මේ හැකියාව තිබුණේ නැහැ. උදාහරණයකට වයස 30 ගණන්වලදී තමයි ඉන්ටර්නෙට් හරහා සන්නිවේදනයට මා යොමු වුණේ. මේ ආකාරයෙන් විද්‍යා මාධ්‍යවේදීයා ගේ භූමිකාව වඩාත් පුළුල් කරගන්නා අතරම විද්‍යා මාධ්‍යවේදියා ගේ කාර්යභාරය පැහැදිලිව හඳුනාගෙන සිටීම ද වැදගත්. විද්‍යා මාධ්‍යකරණය කියන්නේ විද්වතුන් කියන දේ ලියා ගෙන සමාජගත කිරීමක් පමණක් නොවෙයි. ඒ කියන්නේ විද්‍යා මාධ්‍යවේදියා දැනුම ගලා යන පාලමක් පමණක් විය යුතු නැහැ. ඔහු මෙහි ලා පෙරහනක් ද විය යුතුයි. විචාරශීලීව විද්‍යාඥයන් ගේ කාර්යභාරය විග‍්‍රහ කළ යුතුයි. ඒ වගේම ජනතාව ගේ ගැටලූ හඳුනාගෙන ඒවාට විසඳුම් සෙවීම පිණිස විද්‍යාඥයන් වෙත යොමු කළ ුතුයි. මේ කාරණා දෙකේ දීම අගය එකතු කිරීමක් සිදු කිරීම (value addition) තමයි විද්‍යා මාධ්‍යවේදියාගේ කාර්ය භාරය විය යුත්තේ. 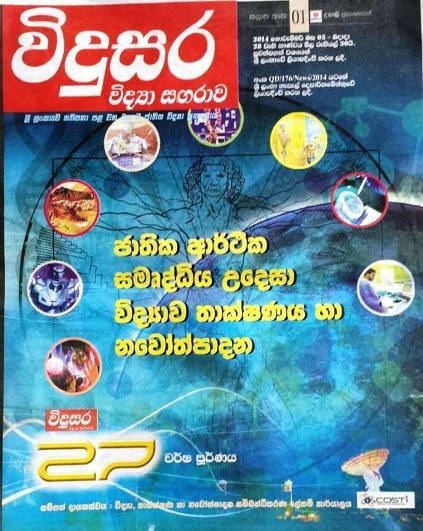 The weekly Sinhala science magazine Vidusara, a publication of Upali Newspapers Limited of Sri Lanka, completes 25 years this week. Sustaining any publication for that long is no mean accomplishment, so everyone involved – journalists, editors, publishers – deserve congratulations. The current editor has done an interview with me for the 25th anniversary issue, which is out today. In it, I discuss the challenges faced by all science communicators, but especially by science journalists working in the developing world. 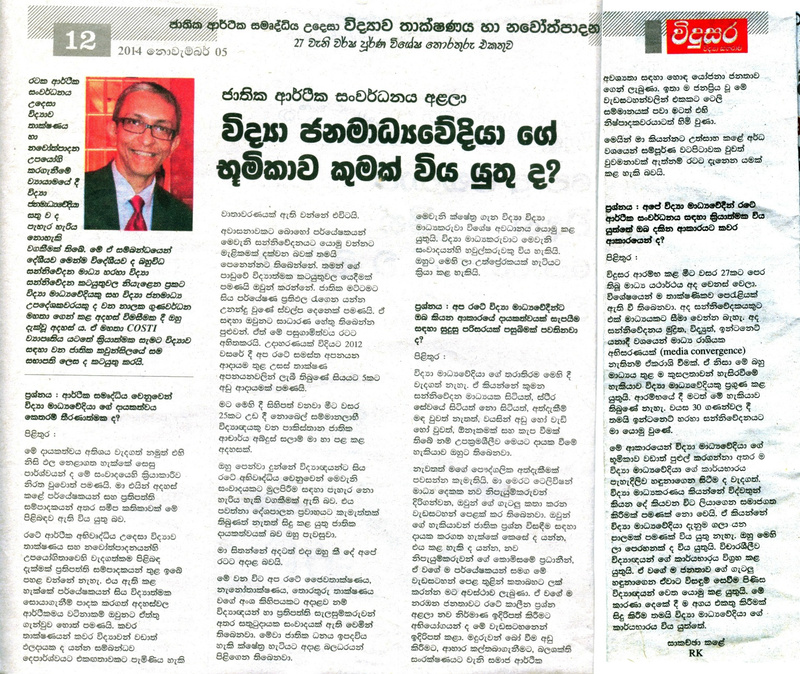 The interview is in Sinhala. Here it is, in pdf, in parts 1 and 2. විද්‍යා සන්නිවේදනය හරිහැටි සිදු වීමට මාධ්‍යකරුවන් හා විද්වතුන් යන දෙපිරිසේ ම වගකීම් සහිත දායකත්වයක්‌ අවශ්‍යයි! I had a marginal involvement in Vidusara at its very inception, in late 1987, which was within a few months of my entering journalism. I take no credit for what the publication has accomplished, and am sometimes exasperated when long-standing readers associate me with it. But after clarifying such nuances for years, I now accept the inevitable association! “Vidusara was launched in 1988 [correction: it really was in Nov 1987] by Upali Newspapers Limited as an experiment in popular science communication. I was at the time working as a science correspondent for that company’s English daily, The Island, and the managing director asked me to advise and guide the new publication. I welcomed this as I was a bilingual writer (Sinhala and English). However, the founder editor of Vidusara was extremely apprehensive about my association with his project and went out of his way to exclude me. I have never tried to understand or analyse the reasons for this; such insecure and insular mindsets are far too common in Sinhala language journalism, even today. 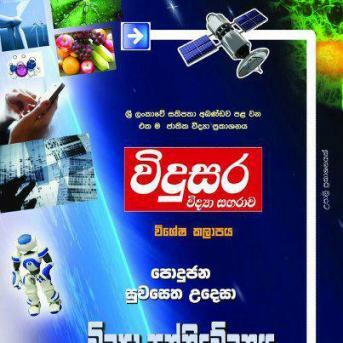 “All in all, I must have written no more than 10 – 12 Sinhala science articles to Vidusara during its first few months of publication in 1988. When I compare that to the several hundred I’ve published in The Island (1986-1995: none of it available online) and many dozens for other English language media outlets – print, broadcast and online – over the years, my writing in Vidusara represents only a very small proportion of my combined media output. However, I must have done a few things well in those articles for discerning readers to remember and refer to it more than two decade later. I’m naturally pleased with such reader recollections.